Okay I lied.. we so do NOT like it hot! It’s another 90ish degree day, which just boggles my mind. I can’t remember the last time I turned on an air conditioner before June! And as we live in a 1929 center hall colonial, we do not have central air (as we have yet to win the lottery). I am apparently a stubborn, horrible cat owner because I refuse to buy an air conditioner for say, the stairwell, where LUNA IS BAKING IN THE SUN AND THEN GIVING ME A LOOK OF CONTEMPT BECAUSE SHE IS HOT. As payback for me not buying her air conditioners for every single room, she refuses to stand still long enough for me to take a picture of her stupidity. 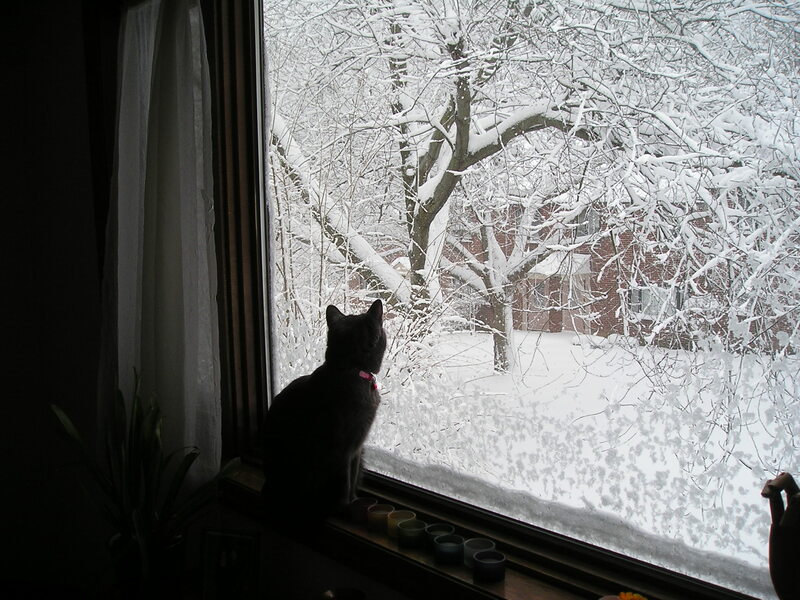 So if you’re having a mini heatwave like we are, here is a vintage photo of Luna from when we got a good 2 feet of snow in a day back in February 2006. Think cool, my friends! Ya think Luna is giving you hell? Try dealing with a 13 month old in this sheltering agony. Not fun when you can’t seem to calm down a sweating child who doesn’t understand the term “I know it’s hot and humid but seriously there is nothing i can do” because the fan doesn’t help him considering this house lacks the abudance of electrical outlets so only place i can plug the fan in it really doesn’t hit him will enough. At least Luna isn’t keeping you up all night screaming and crying. lol wanna trade?